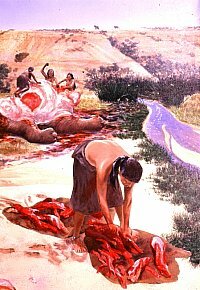 Butchering a Mammoth, 1. A man hoists a boulder over his head to crack open the humerus (upper front leg bone) of a mammoth (Ice-Age elephant). The resulting bone fragments will be used as butchering tools. Behind him several men drag a severed lower leg to one side. Butchering a Bison, 1. 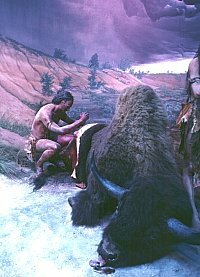 A hunter begins to carve meat off the hindquarter of a partially skinned bison (buffalo). This scene combines a sculpture by Mike O'Brien, with a stuffed bison, and a background scene painted by Nola Davis. 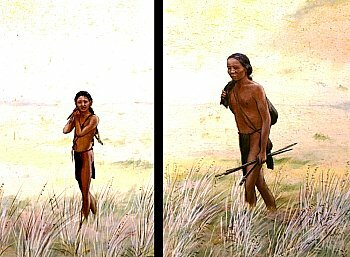 Archaic hunters spring up from the grass to hurl darts with atlatls at bison at the lake's edge. The hunters disguised themselves as wolves and slowly creeped closer before springing. On the horizon family members watch the scene hoping for a successful hunt. Camp on the Plains, 1. A hunter uses sinew to bind an arrowhead to an arrow shaft. Making flour. 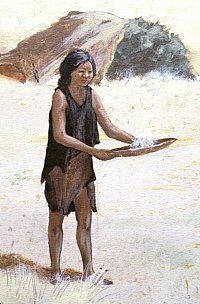 Woman grinds seeds into flour using a metate, a trough-shaped grinding stone. Winnowing seeds, 2. Close up of woman winnowing grass seeds using a finely woven tray. Although tiny, grass seeds are highly nutritious and seasonally abundant, if troublesome to clean. 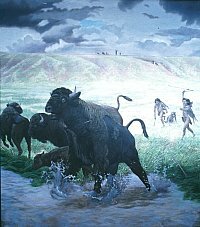 The murals and dioramas created for the Lubbock Lake Landmark by artists Nola Davis and Mike O'Brien of the Texas Parks and Wildlife Department (TPWD) provide vivid depictions of prehistoric life based on archeological evidence. The most spectacular pieces are the life-sized sculptures of Ice-Age animals created by O'Brien and other artists that grace the landscape around the interpretive center. Walking up to these huge beasts really gives you an appreciation for the earliest Paleoindian hunters who crept around Yellowhouse Draw waiting for an opportunity to hurl their puny spears at such formidable prey. Big Game Hunters, indeed! All of the images below are details of larger murals and dioramas. The titles and descriptions used here were coined just for this web exhibit. At the Lubbock Lake Landmark Interpretive Center you can see the complete murals and dioramas as they were intended to be shown. The details shown in these reconstructions are based carefully on archeological research and on other sources of information. Dr. Eileen Johnson and her staff at the Lubbock Lake Landmark provided the TPWD artists with detailed descriptions of actual archeological deposits from which the scenes were inferred. Other details are based on early historic accounts, recorded ethnographic observations, and environmental and climatic data. Butchering a Mammoth, 2. A older man and two women butcher an Ice-Age elephant. Experimental work suggests that an efficient work group could have carved the beast into manageable pieces in just one day. 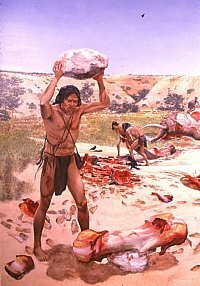 Many more days work would have been required to dry the meat and prepare the hide. Butchering a Bison, 2. A temporary camp on the Llano Estacado near where a bison has been killed. Strips of meat hang to dry on a wooden-pole framework. In the foreground two women carry long bones upslope to the nearby camp to extract the marrow for a delicious meal. Wolves in Disguise, 2. 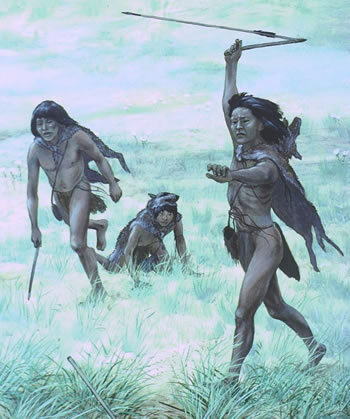 Archaic hunters hurling darts using atlatls (spear-throwers). The hunters wear wolf skin disguises so they could creep close enough to their prey for a kill. Camp on the Plains, 2. A small band of hunters and gatherers relaxes around a typical camp on the Plains, ca. 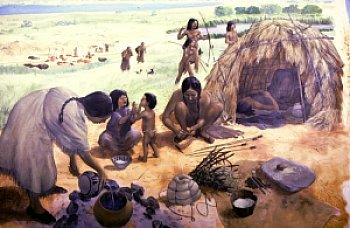 A.D. 1200; in the background bison meat is drying. Successful hunt. Father and son return from a successful hunt carrying small game. 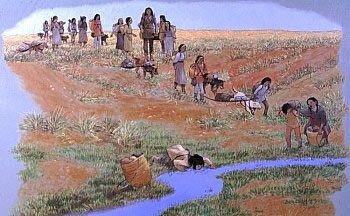 This scene is set in the Middle ate Archaic period, a time when the atlatl the man carries in his hand was still in use. On the Move. 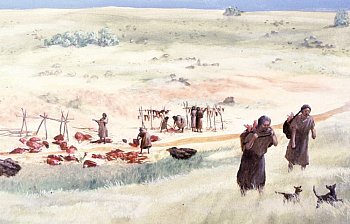 A small line of travelers move in search of a new camp. Dogs equipped with travois (carrying frames) drag many supplies, but each traveler, large and small, carries something. This scene is set in the early 1500s just before the introduction of the horse fundamentally changed life on the Plains. 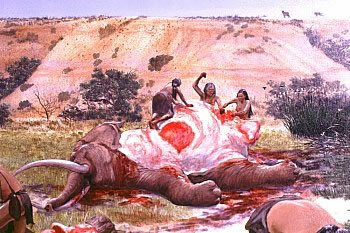 Butchering a Mammoth, 3. A woman cuts strips of elephant meat on a hide, perhaps to be carried elsewhere for dinner. In the background, the beast is being carved up. Butchering a Bison, 3. 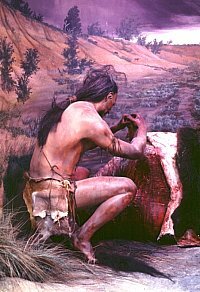 Another view of a hunter beginning to carve meat off the hindquarter of a partially skinned bison (buffalo). This scene combines a sculpture by Mike O'Brien, with a stuffed bison, and a background scene painted by Nola Davis. Summer Storm. 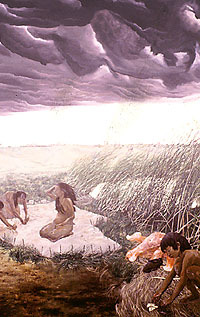 This scene from a larger mural depicts activities along the marshy edge of Lubbock Lake just before a summer storm hits. A woman looks up from scraping a buffalo hide. A boy places bison teeth side-by-side in a small pile. Behind him are the butchered bones of an Ice-Age bison. Camp on the Plains, 3. Detail of camp scene, ca. A.D. 1200. Winnowing seeds, 1. Woman separates grass seeds from the chaff as her young daughter plays nearby. Preparing to Bake. These women are creating an earth oven in which they will bake roots for several days. A pit is dug, rocks are gathered (which will become the heating element), and green vegetation is piled up. The earth oven, when completed, will have multiple layers (from bottom to top): coals, hot rocks, green plants, roots, more green plants, and then a thick cap of earth.